They say there’s nothing new under the sun. And that’s true. Sort of. Rhodiola has been steadily building its reputation as the “Ginseng of the 21st Century”, and with good reason: It is an extremely potent adaptogen, but with fewer limitations. Rhodiola has long been used to reduce stress and anxiety, enhance mood and feelings of well-being (We’ll let you fill in the blanks there), forestall fatigue and build stamina, improve mental focus, and to enhance overall physical energy and athletic performance. You know, to name a few. 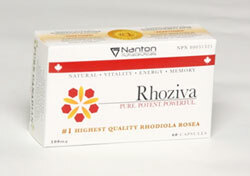 So what makes Rhoziva so different? Consistent Potency. Nanton Nutraceuticals also utilizes a comprehensive 9 step quality assurance program (Think of it as supplemental OCD. Only good for you. So, how does all of ^^ this ^^ translate into the real world? Quite simply, Rhoziva works. Quickly.